Why Did the Dow Really Dump Three Stocks? Today, the Dow Jones Industrial Average changed out three of its 30 components — dropping Aloca, Bank of America and HP in exchange for Nike, Goldman Sachs and Visa. There’s a lot of questions about this move — why did they really trade out one set of companies for the other? 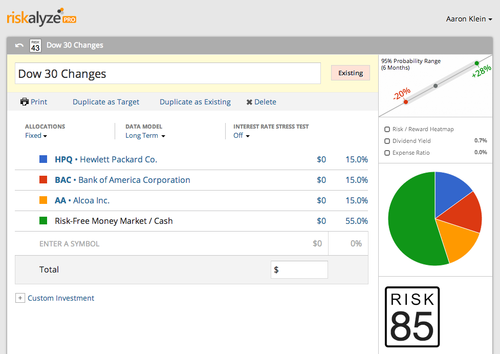 We created a mock portfolio with mostly cash, but allocated 15% to each of these stocks to find out. With the original three stocks, the Risk Number was 85, and the portfolio had downside risk of –20% over the next six months. The new three stocks bring a lot less risk to the Dow index. 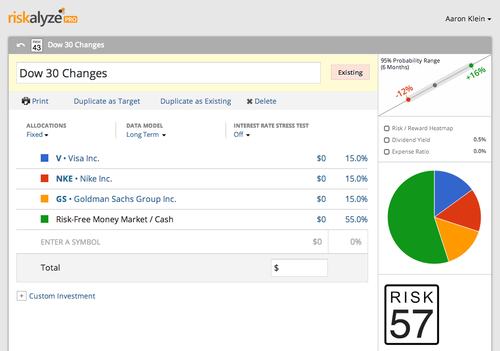 The Risk Number drops to 57, and there’s only –12% downside risk over the next six months. So why did Dow Jones make these component changes? Well, if the theory holds that they want the index to keep going up — they just reduced their risk of it dropping by quite a bit.